PHOTOGRILL: Please tell us about your photography in general. PHOTOGRAPHER: My work is combination of the experience of wandering, of allowing myself to be carried to the locations, and being open to that moment of recognising what is home. For me, breaking into spaces and exploring the traces of what has been left behind feeds my insatiable curiosity about these places and the people who occupied them. My hope is that the photographs create a stage for a story to be told, for the viewer to examine the remainders and piece together something that echoes within their own history. The work is deeply informed by the human relationships that took place in these spaces, but now only remain in the evidence left behind. The lingering floor patterns, ancient mattresses, and bedside tables act as a conduit into a displaced time. Initially, the interest in these spaces is of a visual nature and not a political one, or one related to changes taking place in that society – then as I learn more about these countries, it takes on a bit of a societal interest, but primarily it is visual. PHOTOGRILL: What was it about Cambodia that attracted you? PHOTOGRAPHER: Cambodia and Vietnam held a real fascination for me – the architecture is influenced by a 1970�s soviet feel. I had always wanted to travel to Vietnam because of the history of the Vietnam War, and the Khmer Rouge, which I had researched some during college. At the time, I was living in Berlin and preparing for a show there in the Spring. I was thinking a great deal about the context of where and how the work was shown. On top of that, the Berlin winter was dark and brutal. I had never been to South East Asia before, so I did not really know what to expect. I thought it might be a little like Mexico, but I was surprised by how completely different it felt. One of the things I loved in Cambodia was visiting Sihanoukville – I went there to find an abandon train station. While I was photographing, this cow kept entering the shot. People actually lived in the train station, and finally a little boy helped keep the cow out of the shot. PHOTOGRILL: What was it like working in Cambodia? PHOTOGRAPHER: My process is very much about wandering and discovering and allowing the photographs to shape themselves. There is a book by Rebecca Solnitt, called A Field Guide to Getting Lost. In it she talks about the colour spectrum and the blues we cannot see, almost like the residue of a hidden world. Cambodia felt like it held secrets, long passageways that led only to emptiness. I did not have a specific agenda in mind when I started shooting in Cambodia. I found a local hotel magazine guide and I took a taxi from one hotel to the next. The most daunting obstacle was receiving the permission of the hotel manager to photograph, but usually I paid to rent the room and then it was no problem, since I was a customer. Cambodia was relatively easy to work in, since they are very accustom to tourism, incredibly kind, and most people spoke English. PHOTOGRILL: I�d like to get a sense of what you look for in a building? PHOTOGRAPHER: This is a great question, most of the time I travel alone and my process occasionally involves illicit activities like breaking into places, throwing rocks threw windows, or giving people a bribe for letting me into spaces while their manager is away. Once I do find the actual space I want to capture, then I think it is an indescribable feeling of being pulled towards something. With Phnom Penh Discotheque, the building was near a hotel that I was looking at photographing. The truth is my boyfriend saw the building first, I was making a phone call in the lot right in front of the building. While I was doing this, he walked in and looked at the first floor, then he came back to get me knowing that I would love it. The building itself, was not that interesting from the outside, but once I entered, it had this feeling of history, and traces of people having passed through it, which is crucial to my work. I am not sure how to describe when I�m certain I need to photograph a space, other than that there is something I recognise in it, something that feels like home. I also completely fell in love with the patterned floors. The light was this perfect afternoon light and it seemed to completely set some of the rooms aglow. The space was both abandoned upstairs and in use downstairs as a discotheque, a dichotomy which I found engaging – this very old royal house was being taken over by kids and used as a party scene at night. PHOTOGRILL: How did you work once you were inside the building? PHOTOGRAPHER: When I am shooting I don�t feel that I engage my analytical mind at all, it just becomes a pure experience of seeing. I remember feeling safe since I was not alone, and this gave me the freedom to relax and take my time, which is why I think these images turned out so well. I think I only made slight variations on a specific idea, well two ideas – one is to capture the space as a whole and the second is to then to move closer in and reveal the traces. I always use the same equipment, which is a Pentax 6 x 7 and my tripod. I use the Pentax because it is small enough for me to carry in a backpack and large enough for me to print 30 x 40 inches or larger. It is a great camera when I am in rushed circumstances because it is roll film and it goes quickly. I do remember several times in this building, packing all my gear up and then realizing I had found another shot and unpacking everything again. The architecture here seemed to engage me for a disproportionate amount of time, I recall being surprised by how long I stayed there shooting. I shot this on film, in natural daylight, and the only real technical aspect were the long exposures, two minutes or more for most of the shots. This was a very prolific day for me, I just loved this building. The shoot took almost five hours, and I think it was at least 150 images, but all from this same building. In the entire trip, I took around 1000 shots, and in total I probably photographed twenty buildings. 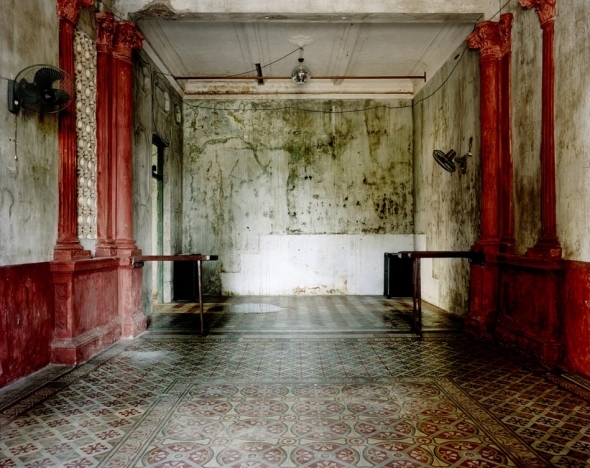 PHOTOGRILL: What do the Cambodian people think of you photographing their old buildings? PHOTOGRAPHER: Most of the time, people are usually a bit uninterested about the work I do in their buildings. In this particular situation with the discotheque, the guard did not seem to care. I later found out, from someone who came to see the exhibition in Berlin and recognized the space, that this particular building had also been used to exhibit contemporary art for a celebration. In Cambodia, the children were very fascinated by my camera equipment. Most recently, in India it was very difficult to get the permission to photograph the cinemas, because people were suspicious of me. The people of India were very curious about what I was doing, where I was from, and what my work was like. Usually, I had anywhere from ten to thirty people watching me work while I shot the cinemas. There was a real indescribable warmth in India. PHOTOGRILL: Is post processing important to your work? PHOTOGRAPHER: Yes, the post process is very important to my work, but I am a traditional darkroom printer, so it is different. I have to strike a delicate balance of not being too close to the work by allowing myself distance after I make the photographs. But also I must not lose interest in the work by doing too much darkroom time and getting burned out. With this particular project, I printed my own contact sheets in New York and then I flew straight back to Berlin where I was suppose to be living full time for my DAAD fellowship. I had broken the rules a bit by sneaking off to Cambodia to make the new work, but at that point, Berlin was so dark and depressing I was ready to jump off a bridge. Then once I was back in Berlin I sorted through all of these images on the computer (because there was no money to print them) and repeatedly narrowed it down. Finally, I had about 30 images printed into tests in order to edit for the exhibition and I chose which ones would become the final 30 x 40 inch prints. For me, this in depth editing of the work was brutal and just as important as the shooting of the work. This is the part of how I essentially decide what the story is I want to tell. PHOTOGRILL: How has your photography career progressed? PHOTOGRAPHER: I received an MFA in Photography from Hunter College in 2005 and BA in 1999 from Yale University where I studied English and Photography. During my studies I worked with Reiner Leist, Lois Conner, and Todd Papageorge. In the Spring of 2001, I moved to New York City, where I have been living and working ever since. In 2008 I received a DAAD fellowship to live in Berlin, where I had been photographing in Eastern Europe, off and on, for years. While living in Berlin, Revolver published a two-person catalogue of my work. I have been showing my work at various galleries and institutions in both Europe and the US, including: Dina4Projekte, Haas & Fischer Gallery, Galerie Open, Pinakothek der Moderne, Kunstverein Munich, and the Loeb Art Center at Vassar College. For the past five years, I have worked on a project photographing old Soviet hotel rooms, in countries such as Lithuania, Latvia, Bulgaria, Romania, Cuba, Moldova, and Eastern Germany. In December 2009, I received a fellowship from the Tiffany Foundation, which allowed me to travel to India where I photographed old Cinemas. This past spring, I had my first museum show at the Loeb Art Center at Vassar College, where I was invited, along with Tina Barney and Tim Davis, to photograph the campus over the course of one year. PHOTOGRAPHER: For some reason this question made me think of my first photograph from when I was thirteen. I remember constructing a scene with no people in it. I photographed an old chair in my house with the back door open and the reflection of the daylight on the intricate wood of the chair. It is an image that still resonates with me and seems to hold everything I look for now a sense of isolation and emptiness, the lack of people but in a way it is a stage waiting for people, the traces of history, the architecture and the domestic background. The other thing I should also mention is a recent collobaration with ArtStar.com, where I have a couple of images from my work photographing cinemas in India. What I love about ArtStar is that they are making my work available to everyone, because it is very affordable. I like to think of having these images from India in house in Portland, Oregon or an apartment in New York City. I have also been really amazed with how much support and exposure they have provided for me as an emerging artist. They are working with some fantastic artists in both their main site and with littlecollector.com – eventually the website will be launched in 5 languages. And not to leave out the fact that they are just really fantastic people. This entry was posted on Thursday, July 21st, 2011 at 8:10 am. It is filed under The Grill and tagged with Creative Photography, Photographic Techniques. You can follow any responses to this entry through the RSS 2.0 feed. This is such a great interview. Katherine Newbegin is an outstanding photographer and ArtStar is so pleased to feature her work and make her latest series photographing cinemas in India available to collectors.